Anyone who has experienced xerostomia knows that it is frustrating, especially when relief products wear off quickly or are inconvenient to use. In addition to discomfort, the absence of saliva can lead to the development and progression of tooth decay. 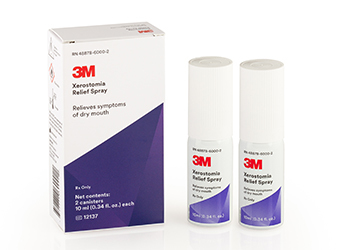 3M™ Xerostomia Relief Spray is a new, clinically-proven solution that provides prescription-strength relief of xerostomia symptoms — for up to 4 hours per use. As a lipid-based spray, 3M Xerostomia Relief Spray achieves relief by moistening and lubricating mucosa, and showed an improvement in dry mouth symptoms in 92% of clinical study participants. Available only by prescription from a dental professional, the spray is conveniently portable and ready to use without any pre-mixing or preparation requirements. For some, xerostomia is a minor inconvenience. For others, it is a debilitating symptom that can make it difficult to speak, eat and swallow, as well as result in increased dental caries. Since xerostomia is a common side effect of many medications and a symptom of certain illnesses, it’s crucial for dental professionals to know when their patients may be experiencing xerostomia, and to have a plan in place to prevent the risk of dentition breakdown. For example, when prescribing 3M Xerostomia Relief Spray, clinicians should also consider offering in-office fluoride treatments like 3M™ Vanish™ 5% Sodium Fluoride White Varnish with Tri-Calcium Phosphate, and homecare treatments like 3M™ Clinpro™ 5000 1.1% Sodium Fluoride Anti-Cavity Toothpaste and 3M™ TheraMints™ Xylitol Mints, which stimulate the flow of saliva. For more information on 3M Xerostomia Relief Spray, visit: 3M.com/Xerostomia.